Enjoy watching exciting movies and listening terrific music with your Nintendo Wii. With the help of Xilisoft Wii Converter, it can't be more easier to turn your Nintendo Wii to a multi-media player by converting and creating compatible videos and music for enjoyment. More than a converter, Xilisoft Wii Converter also enables you to perfect or customize output files by adjusting a series of professional parameters like Video Size, Bitrate, Zoom, Sample Rate, Channels, Volume and many others. Take a preview in ratio aspect 4:3 or 16:9 as you prefer and take screen shots to reserve interesting scenarios. Convert AVI, MPEG, WMV, MP4, FLV, MKV, H.264/MPEG-4, DivX, XviD, MOV, RM, RMVB, M4V, VOB, ASF, 3GP, 3G2, SWF, H.261, H.264, DV, DIF, MJPG, MJPEG, DVR-MS, NUT, QT, YUV, DAT, MPV, NSV, H.264/MPEG-4 AVC (*.mp4) files and etc to Wii supported video formats Wii-AVI or Wii-MOV. 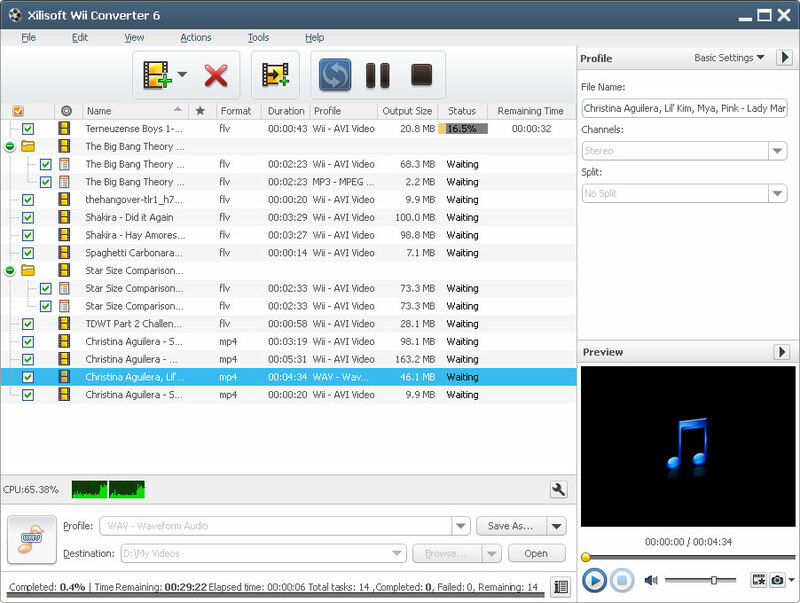 Convert WAV, WMA, AAC, AC3, AIFF, AIF, CDA, FLAC, MPA, M4A files and etc to Wii supported audio formats MP3 or WAV. Multi-core CPU is available which boosts the processing speed to maximum. Xilisoft Wii Converter helps you to transfer files directly to your Wii after conversions are completed. You can add more than one profile to output different formats files from one same source. Provides a built-in player for preview and convenient to take screen shots. You are free to select appropriate output video size, video and audio quality. More parameters can also be adjusted to preference, like Bitrate, Frame Rate, Aspect Ratio and etc. Up to 8 lingual interfaces totally are available: English, German, Spanish, Italian, French, Japanese, Simplified Chinese and Traditional Chinese. Best WMV converter at video convert, support converting AVI files to MPEG and WMV to AVI easily and fast.